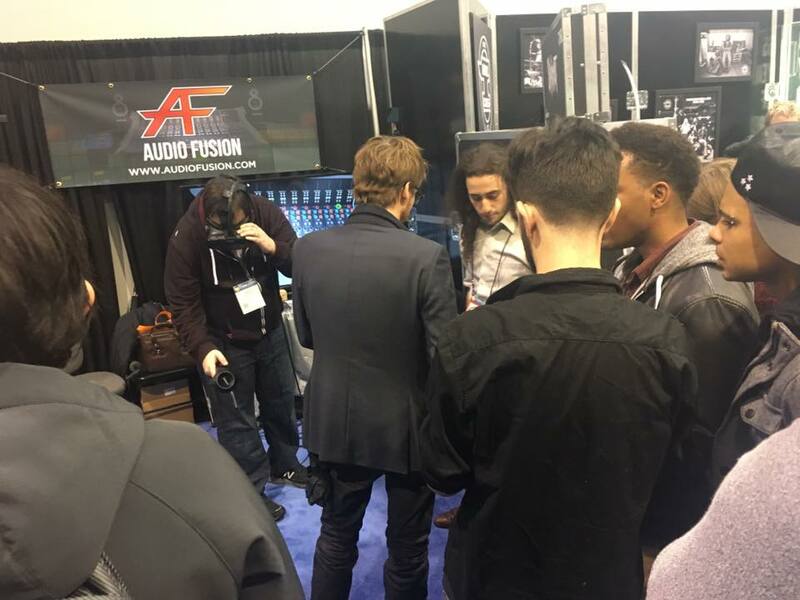 We were honored to participate in the very first AES@NAMM in Anaheim, January 2018. 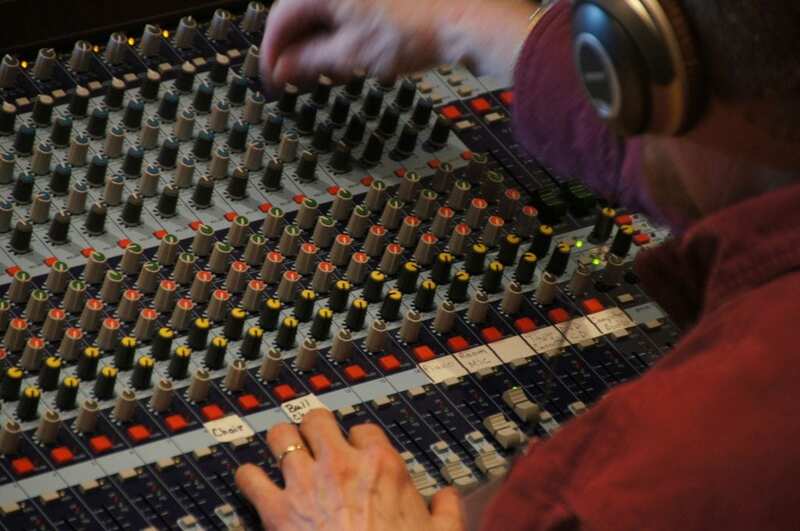 The Audio Engineering Society is the world’s leading community of audio engineers. NAMM is the world’s leading community of music industry professionals. This year was bigger than ever with new convention halls dedicated to pro-audio. We hosted 4 hybrid demo/presentations given over two days to attendees, who were mostly educators from around the world. They contributed to session sharing their experiences in the field educating students resonating the need for software tools like the Virtual Studio. The previous year at the 2017 show, we exhibited on the main showroom floor. It was a successful venture and we came away with a much deeper understanding of the various music markets in play. Virtual Reality was still brand-new at the time and we were one of the only companies displaying a full Room-Scale VR Experience. Attendees crowded around the booth patiently waiting their turn to try the product and ask questions afterwards. Even at this year’s show, there were requests made to schedule a demos ahead of time to avoid the waiting ques! This year we decided we wanted to host our sessions and demos in an environment that would very targeted towards educators and students who wanted more information than just a limited demo. 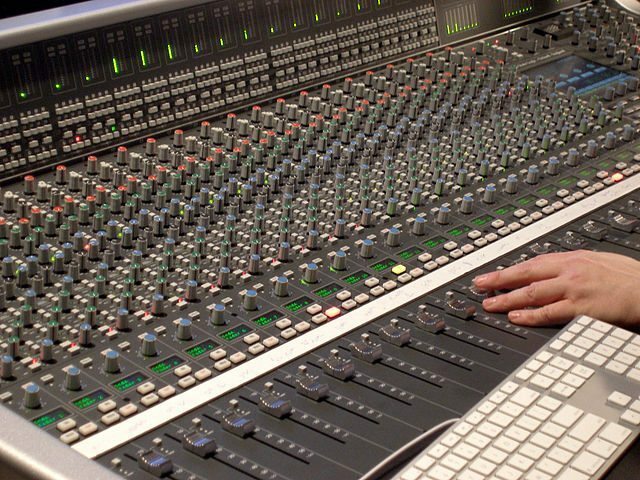 During all sessions, studio environments and respected signal flow arrangements were introduced. All functions and routing possibilities were demonstrated. Finally, we shared our new modular lesson-plans created by Education Officer, Anthony Schultz, designed to assist educators looking to integrate our training tools into a course at a pace that works for them. Making it’s first appearance at a public event, the iOS edition of Virtual Studio was previewed on mobile and tablets! Stay tuned for more developments and news! Keeping computer software up to date could present challenges for users and businesses. The whole idea of offering updates is to constantly better the core value and functionality of a software then, deliver it to users as intuitively as possible. Strangely, it tends to feel like I’m forcing my way through more steps to get through the update process. We want users to get the most from using our training simulations. That means we need to deliver new versions of our software to them as soon as possible.. Not only do we want to notify our users of an update but, we made a process refreshes files during run-time. The application never quits. The idea is that it be just like loading a browser page. In this latest update 0.4.3 we introduce, “Refresh Updates” which notifies users of an existing newer version of VAS before starting a session and allows them to download it to be used during run-time. If the internet connection is slow, users may continue using the app until the process completes. What this means for Schools or Businesses? This was an interesting problem to solve for businesses where computer labs generally have “Freeze States” on their computers. The computer restores to a backup every time it is started or restarted. That means any downloaded updates would be lost if a computer restores to a freeze state. Worse of all, someone would have to put in the hours to manually setup all the machines. There can be shortcuts but, the manual process typically includes: Unlocking Computer from freeze mode. Downloading Installing Activate Restarting Computer to Verify Lock Computer to new frozen state Most of our partner schools have computers that refresh to a prior state every time they log-in. This creates an obstacle for them to keep up with the most recent versions of Virtual Analog Studio. With the new “Refresh Update”, IT personnel wont have to spend hours updating campus computers. The changes would appear without a new activation process. Even if the computer cleans to a previous backup, there is option to run the latest version of VAS without saving it offline. Many learning centers around the world offer computer labs with cutting edge technology. Updating the software is a common obstacle for each entity. We want to offer the benefits of higher processing with standalone software utilizing the benefits of the web where needed. We’re committed to empowering audio education and are pleased to be conquering this obstacle. Download VAS2d – Click Here! 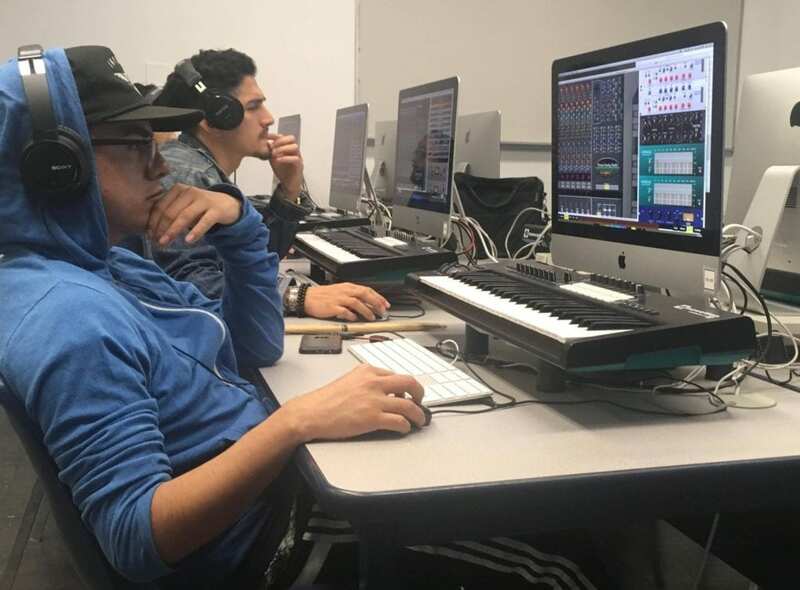 Transitioning the use of Virtual Analog Studio software into classrooms can be a challenge. It may seem simple but, we’ve seen common points of confusion for educators when adopting new technologies. We set out to overcome these obstacles and we’re brining on a new Education Officer, Anthony Schultz, to create relatable content for students & educators in our community. 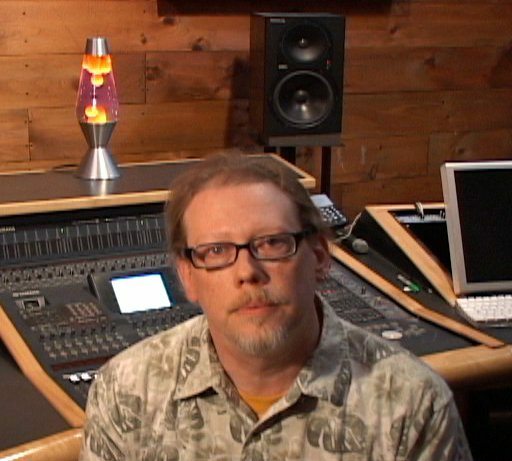 Anthony is a music producer, educator and studio owner for over 20 years. He given courses at the New England Institute of The Arts and Berklee College of Music. He is a dedicated member of the Audio Engineering Society serving as the VP of the Eastern Region of the US/Canada and Chair of Regions & Sections, overseeing all AES Sections Worldwide. During his time, AES sections have grown worldwide. We jumped on the opportunity to work with Anthony on our educational offerings. Now available upon request are a set of modular lesson-plans that could be used to create classes, courses & workshops featuring advanced concepts that could could only be accessed in real world class studio setups . Each lesson covers a portion of topics, reading materials, milestone markers and content that could be demonstrated and practiced at home, in the class or lab. There is NO REQUIREMENT to have a studio in order to understand the software. “I am proud to work with Audio Fusion as a new Education Officer. 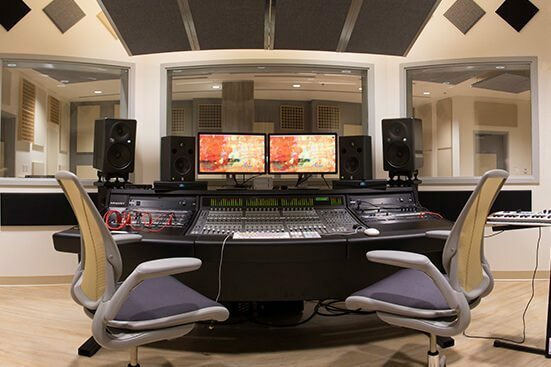 I hope my contributions of blogs and video tutorials will bring an understanding and greater appreciation for the art and science of audio recording.” Read about Anthony’s take on the state of audio education today. Click here. All my life I knew I wanted to be involved in music. Being enrolled in an education program can keep one busy and I didn't always get the time to explore different aspects of pro audio. My first steps towards career-defining independent growth was that day in 2013 when I searched the internet for “audio and music technology conventions” in my area. Fortunately, the Audio Engineering Society was hosting a convention in NYC. Without thinking twice I took off from school to attend this event. Being immersed in the industry revealed many doorways not previously known to me. AES was "pro-audio wonderland." Like a little boy wandering candy shop, I strolled around the exhibit halls... attended my first DSP lectures.... attended my first student party at Avatar Studios. The people that surrounded me weren't just passionated about audio, they we're some of the most elite professionals making an impact in the industry. The biggest takeaways from my first convention was the inspiration to become involved in the scientific advancement of audio technology. There was this realization that the individuals who influenced the industry were human beings! I just needed to be aware of the tools and dedicated time. At one of the lectures I met Will Pirkle, educator and writer from University of Miami, who told me about his DSP tool & book, that I would soon read after the show. It empowered me to understand core concepts of audio programming and enable my dream of developing applications to start Audio Fusion. That first AES show ignited a fire of curiosity that will last a lifetime. “A New Beginning” Immediately after the show, I was searching for ways to sink my hands with coding my own plugins and applications. By the time I graduated university, I had a functioning prototype of Virtual Analog Studio and was already getting the attention of a big console manufacturer. All I wanted was to continue growing through this new project. The AES Student Design Competition was the goal I set for myself. It was a way for me to solidify my achievement in the early years of my career. 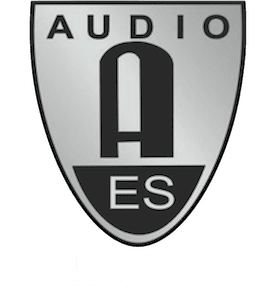 At the next AES convention in Los Angeles 2014 the Virtual Analog Studio project made it’s debut and took the SILVER award. “Never Stop Learning” It was clear that Virtual Analog Studio solved a serious problem in the education space. The pain point of not having access to studio technology came from a very real place. With the intention of making a deeper and fully immersive recording studio experience, I hired a friend to create a detailed 3D environment of a studio environment, the same model is the main studio we offer in in the 3D edition. The original programmer programmer backed out of the project, so I resumed duties with nearly no experience. It was because of a book I read on DSP that I was able to build a workable first prototype of Virtual Analog Studio in the 3D edition with a new audio engine. Before ever finishing the 3D project, this new concept of "Virtual Reality" started to emerge. Over several months, I attended local events in New York City to experiment with this new technology. By early 2016, I purchased my own high end VR rig. FINALLY, I was able to literally touch the hard work I’ve done over the last several years. It’s one of the few moments I felt truly rewarded by the universe… I was back in the studio! The world needed to see this. Exhibiting at AES Los Angeles For years I dreamt of displaying Virtual Analog Studio on the main floor of AES. Beyond expectations it would be within Virtual Reality as a fully immersive experience by the time of it's debut at AES 2017 in Los Angeles. The project resonated with students, educators and professionals from all over the world. Im proud that so many took interest in the project. Those experiences have since motivated me to continue to deliver a higher caliber software for education. We received several reviews and an award from seasoned-veteran Craig Anderton! Read about it: click here. The Future Unfortunately, it was decided that we would not be on the exhibit floor of the AES NY show in 2017. 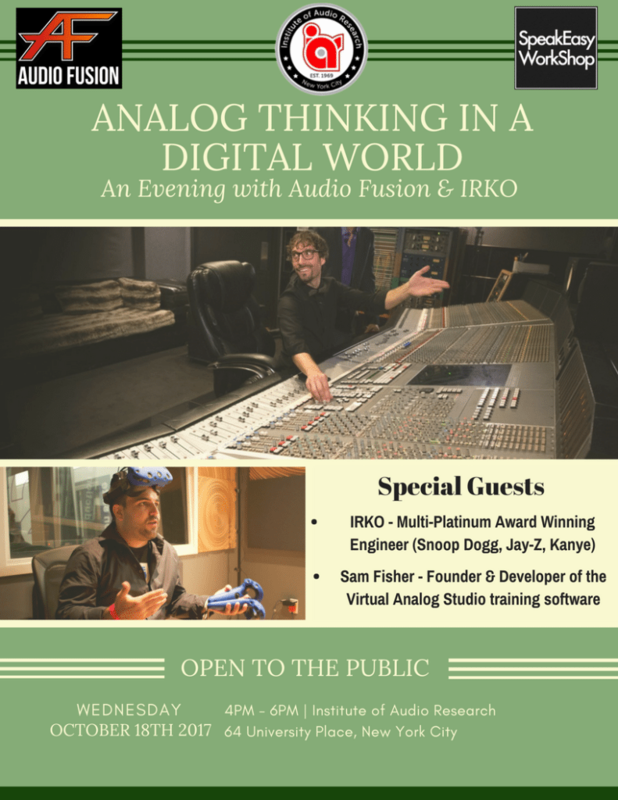 Instead, we were on the floor networking and hosting an event with Multi-Platinum award winning engineer, IRKO (Snoop Dogg, Jay-Z, David Guetta) at the Institute of Audio Research. We hope to participate in future shows and connect with enthusiasts on the ground. We encourage everyone to be at events such as these. You might not see us on the show floor but, we are somewhere nearby making an impact.